Engaged couples have elopement ceremonies in Tennessee's Great Smoky Mountains. While some brides and grooms desire a grandiose wedding ceremony, some couples prefer a secret, intimate occasion. Some of Tennessee's bed and breakfasts, mountain lodges and chapels offer elopement packages, which include the cost of ceremony and access to a honeymoon suite. These packages usually cover paying for the wedding official and certificate. Elopement locations include the Great Smoky Mountains and Cherokee National Forest. Chapel at the Park (chapelatthepark.com) is a Great Smoky Mountain venue in eastern Gatlinburg. This chapel offers three elopement packages. 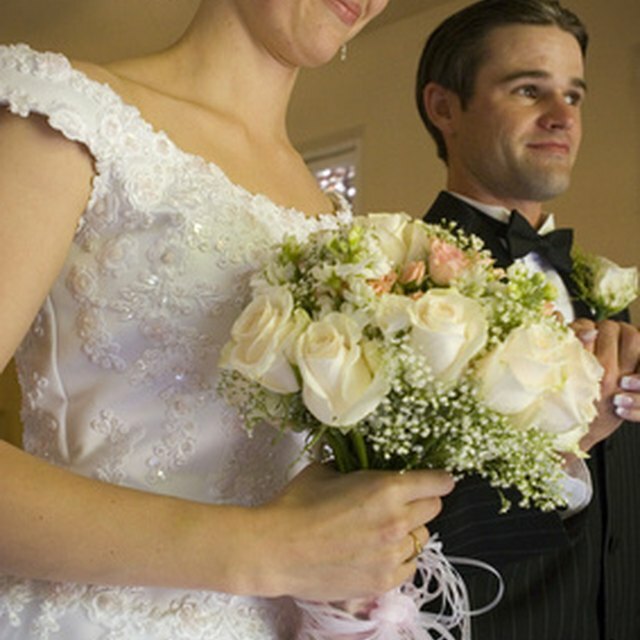 The least expensive package is the Tennessee Twosome, which includes a candlelight ceremony, 12 4x6 portraits and a “Just Married” sign for $224, as of April 2011; this package is only available on the weekdays. For $1739 to $1,939, engaged couples have access to the Elegant Elopement; this package has two heart-shaped wedding cakes, two nights of honeymoon lodging, wedding DVD and floral bouquet for the bride. Chapel at the Park has a gazebo for outdoor ceremonies. Bluff Mountain Inn (bluffmountaininn.com) is a wedding venue and lodging option in the heart of the Great Smoky Mountains. This venue provides the Elope to the Mountains package. The package includes an outdoor ceremony on the Inn's lawn, ceremony setup, a wedding official, music and a wedding coordinator. After the ceremony, the newlyweds have access to Bluff Mountain's honeymoon suite. Some of the Bluff Mountain's reception amenities are a heart-shaped wedding cake, professional photographer and dinner for the couple at a nearby restaurant of their choice. Sevierville's Berry Springs Lodge (berrysprings.com) is a Great Smoky Mountains lodging option with log-cabin style accommodations. For elopements, Berry Springs Lodge provides a balcony area for ceremonies. Elopement packages include a wedding official, one-hour photography session and 10 guests may attend the ceremony. Berry Springs also offers a honeymoon suite for two nights after the ceremony. The suite features a stone fireplace and whirlpool tub. During their stay, the Lodge serves the newlyweds breakfast in the mornings and desserts in the evenings. Located in Gordonsville, Butterfly Hollow (butterflyhollow.com) is a bed and breakfast retreat in Central Tennessee, approximately an hour east of Nashville. This bed and breakfast provides two elopement packages, Wedding for Two and Elope to the Hollow. Wedding for Two allows the newlyweds to spend a two-night honeymoon at Butterfly Hollow, while Elope to the Hollow includes seating for up to six guests. Both packages offer wedding photos, cakes and certificates. Prospect Hill is a bed and breakfast in Mountain City, a small city in the heart of Cherokee National Forest. This lodging option hosts elopement ceremonies in Prospect Hill's pavilion. Wedding parties may bring up to four guests for this type of ceremony. The Elopement for Two Inclusive Package includes a two-night stay in the Romance Room, which is Prospect Hill's honeymoon suite. This package also includes wedding cake and photographs of the ceremony. Prospect Hill also has the Wedding Garden for outdoor ceremonies.